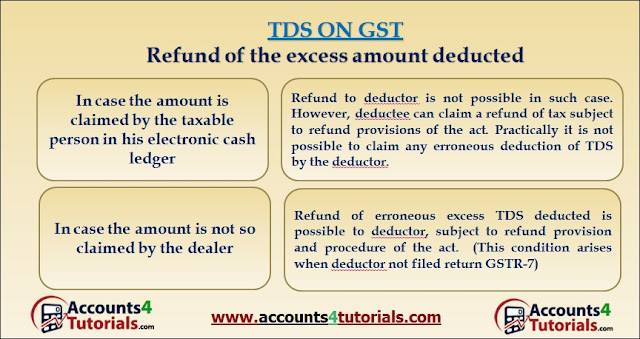 TDS deducted should be reported in a return form GSTR 7 by the 10th day of the month succeeding the month in which TDS was collected. They need to issue a certificate in form GSTR-7A to the supplier within 5 days of deducting TDS mentioning therein the contract value, rate of deduction, amount deducted, the amount paid to theappropriate Government. How can the Deductee claim the benefit of TDS? The supplier (deductee) shall claim credit, in his electronic cash ledger, of the tax deducted and reflected in the return GSTR-7 filed by the deductor. Any amount deducted as TDS and reported in GSTR – 7 will automatically reflect in electronic cash ledger. Refund to deductor is not possible in such case. However, deductee can claim a refund of tax subject to refund provisions of the act. 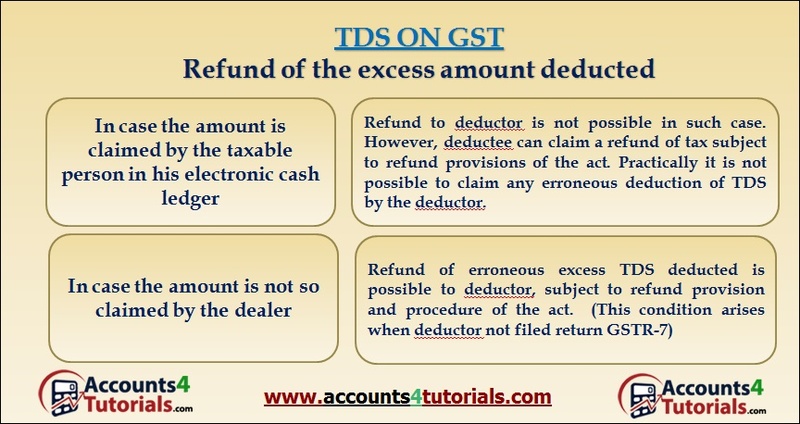 Practically it is not possible to claim any erroneous deduction of TDS by the deductor. 1. Applicant must have a valid PAN or a TAN. 4. Applicant must have the following documents and information on all mandatory fields as required for registration. for premises not covered above: A consent letter with any document in support of the ownership like property tax or electricity bill. (d) DSC of the DDO. (e) If authorized signatory is other than DDO then passport size photo of such person. Goods and Services Tax is an indirect tax levied on the supply of goods and/or services. It is a destination based tax. The GST would apply to all goods other than alcoholic liquor for human consumption and five Petroleum products. The persons whose turnover in a financial year is more than Rs.20 Lakhs are need to be registered under GST. For registering under GST, PAN is compulsory. All the registered taxable persons will get a 15 digit PAN based GSTIN. SGST: Levied by State Government for supplies made within the state. CGST: Levied by Central Government for supplies made within the state. IGST: Levied on inter-state transactions.